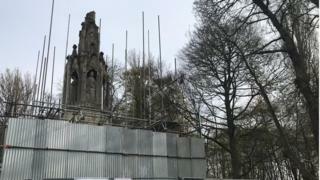 Restoration work has started on a 13th Century monument to a medieval queen that was "falling apart". The Eleanor Cross on London Road, Northampton, was built in 1291 for Queen Eleanor, the wife of King Edward I, but needs urgent masonry repairs. The £95,000 work by Northampton Borough Council and Historic England was due to start last autumn, but was delayed. Scaffolding has been put up and contractors will start lime mortar work on cracks to conclude in late summer. Mike Ingram, a local resident who has been campaigning to save the cross, said it was a "huge relief" that it had not toppled over in the winter because of its poor state. In January, a Northampton Borough Council meeting heard Queen Eleanor would be "turning in her tomb" because her monument had been rotting. And more than 1,600 people signed a petition calling for netting to protect the monument during the winter months. Twelve crosses were built by King Edward I after Queen Eleanor's death near Lincoln in 1290. They were constructed at each place her funeral cortege stopped on its way to London. The cross in Northampton is one of only three which remain. Dr David Carrington, from Skillington Workshop, the conservator tasked with completing the repair work, said he would do all he could to "arrest the rate of decay". He said: "We will look at two things - the structure and corroding iron work. It [the cross] is up there with the best work of the period [13th Century]." Henry Sanders, from architects Acanthus Clews, said: "This sort of project is very, very rare. It's also a monument that sticks in people's imagination. "[The crosses] are intrinsic to the love story between Edward I and Queen Eleanor. It is a jewel and joy to work on as an architect."